The fundamentals of Italian cuisine are simple - for example, Italian cooking uses olive oil rather than butter, uses either salty, highly matured cheeses like Parmesan or unsalted, low fat cheese like mozzarella and ricotta. Deep frying is very unusual, while oven-baking is popular. Italian cuisine relies on tomatoes and strongly-flavoured meats like pancetta and salami. Cooking Pasta – the fundamental mistake many people make when cooking any pasta is to underestimate the size of pan you need to use – because pasta requires a lot of water at a rolling boil, having too small a pan will either cause the water to boil over or the pasta to stick together. For 500 grams of pasta, you need to boil four litres of water in your pan and add at least two teaspoons of salt. This ensures that the water has an even cooking temperature throughout, but it remains in the water rather than penetrating the pasta itself, so don’t be afraid to be generous with the salt. In addition, when cooking short cut pasta (macaroni, penne, spiralli) you can add a teaspoon of oil to the water to stop the pasta sticking together in the pan. Above all, timing matters with pasta cookery – three to five minutes is all that is needed for fresh pasta, although dried pasta can take between 10 and 15 minutes from the time that the water returns to the boil. To prevent the pan boiling over, put a wooden spoon or fork in it, this allows the surface tension of the water to be broken. 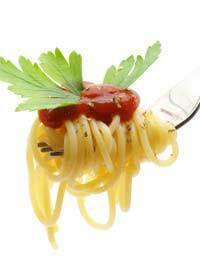 Your pasta is perfectly cooked when still slightly firm to the teeth, which the Italians call al dente. The pasta will continue cooking a little after you drain it so learn to remove it from the heat when it’s still slightly undercooked. The Italian ratio of pasta to sauce is very different to ours – Italians consider the pasta to be the basis of the meal while the sauce is merely flavouring. There should only be enough sauce to coat each piece of pasta, not to drown it. Making Pizza – in Italy, pizzas are cooked in wood-fired ovens at extremely high temperatures, so when you want to make pizza at home, a key point is to crank up your oven to the highest temperature possible. Pizza dough needs to be prepared and transferred to the oven very swiftly because if the sauce and toppings are allowed to sink into it, the base will become soggy and saturated with tomato so that it has a flabby, soggy texture. The ideal tool for cooking your pizza is a round metal pizza tray with holes punched into it to allow the heat to circulate underneath, giving it a crispy texture to both top and bottom. This tray should be preheated along with the oven. When making the pizza, have all ingredients to hand because the longer the pizza dough stands, absorbing the toppings while you look for olives or parmesan, the soggier it will become. One tip that is often used in Italian kitchens is to sprinkle any fresh herbs you are using onto the base before adding the tomato sauce, as this brings out their flavour without scorching them in the intense heat of the oven, and don’t ladle the sauce onto the dough, because if it overflows it will burn and if you use too much, it will make the pizza soggy. Making Tiramisu – this dessert translates as ‘pick me up’ and its popularity relates to the relationship of the sweet cream cheese and sponge with strong coffee. There’s a myth that this dessert was invented for Cosimo de Medici in the 1600s, but it’s much more likely that the delicacy wasn’t invented until the 1970s. The dish involves sponge fingers steeped in coffee (and/or marsala wine or rum, to taste) and then layered with mascarpone cheese and custard – this layered dessert is often finished off with a sprinkle of cocoa powder. The most common mistake when creating tiramisu is over-soaking the sponge fingers, resulting in a pudding which is soggy and slimy rather than firm and moist.